British lawmakers again voted to reject, this time by a margin of 344-286, Prime Minister Theresa May’s EU withdrawal agreement at a special sitting Friday. The entire Brexit package was previously defeated twice by large margins. 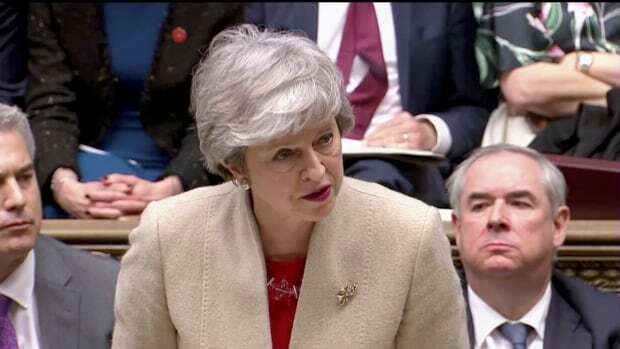 May agreed with the EU to delay Brexit from the originally planned March 29 until April 12, with a further delay until May 22 on offer if May could get her divorce package ratified by lawmakers this week. She expressed “profound regret” the government hadn’t been able to deliver on its promise by March 29. Britain’s Attorney General Geoffrey Cox, in addition to May, tried to emphasize the urgency of voting in favour. Opposition Leader Jeremy Corbyn continued to assail the deal in Friday’s session. It appeared May had some momentum ahead of the vote. But all reports suggested the 10-member Democratic Unionist Party, which propped up the government after the last election in a supply-and-confidence arrangement, were not going to vote in favour. May on Wednesday pledged to quit if her deal was passed but even that failed to immediately win over many Brexit supporters in her party.